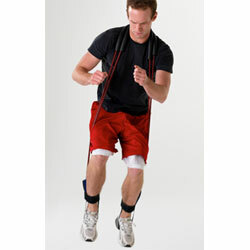 The Power Jumper adds elastic resistance to all your jumps and brings quicker results. Take it off and take flight! Easy to use, an entire team can circuit through it in seconds. Take it to the field or court. Includes 2 resistance tubes with webbed handles at each end (to place on feet or for partner to hold), padded sleeve. Instruction manual included. Takes up to 3 elastic cords. Includes 2 cords. Do it with Jumpsoles for the ultimate jump workout. Hi JumpUSA!! The Power Jumper is now a staple of my jump/legs workout!! Dat stuff is amazing, I already gained at least 4 inches in like 2-3 workouts with it!! I basically do squats, plyometrics (rim jumps, penultimate step, box jumps, depth jumps) or superset like step-ups with weight and the power jumper followed by flying step-ups with only the power jumper on. One of the things I love with the Power Jumper is the intensity I'm getting in my workouts. In just 30min, I can feel I'm exhausted and my central nervous system is firing like crazy, a few days of rest and my speed, jump and quickness just amazed myself! I love the play basketball pick up games and my confidence and trust in my potential are also improving! I can now easily dunk one handed and the Power Jumper is allowing me to go for the 2 hand flush! Thank you for this amazing product, when I get stronger I'll order the 3rd cord!